Sound like a good Valentine’s Day meal? That’s what I thought, too. But it could be a darn good meal any time of year, especially if it’s cold out and you don’t mind roasting, simmering and cooking for a while. In fact, you want to do just that, in your warm and toasty home. But I had to go out and source some duck legs for this dish, and the closest (and best) option for me was Hudson Valley Duck Farm‘s stand at Grand Army Plaza Greenmarket on Saturday. Oh, that Saturday where temperatures were supposed to drop beneath 20 degrees Fahrenheit with wind chills? Yes, that one. I braved the weather, but the Greenmarket staff braved it for much longer than I. When I came upon an incredibly sparse and empty-looking Greenmarket that Saturday, I was really worried that Hudson Valley Duck would not be there with the duck leg that I was so looking forward to buying. But they were — or one guy, rather, was. He was actually lying on his back on top of the farmstand’s folding table with his eyes closed, trying to soak in what meager sun was emanating from the sky when I approached. It looked like nobody else was shopping, and I couldn’t blame him. When I interrupted to ask if he was still open for business I felt bad, and sympathized on the weather. But he couldn’t have seemed more happy to jump up and do something, showing me several duck legs and offering his take on his favorite duck charcuterie (I left with a duck hard sausage along with a leg). So let me tell you again: go shop at the Greenmarket, even if it’s not as fetching as in the lush, summer months full of tomatoes and stuff; the poor, freezing farmstand workers who are out in the elements all day for your goshdarn food buying’s sake will be all the happier to assist you. 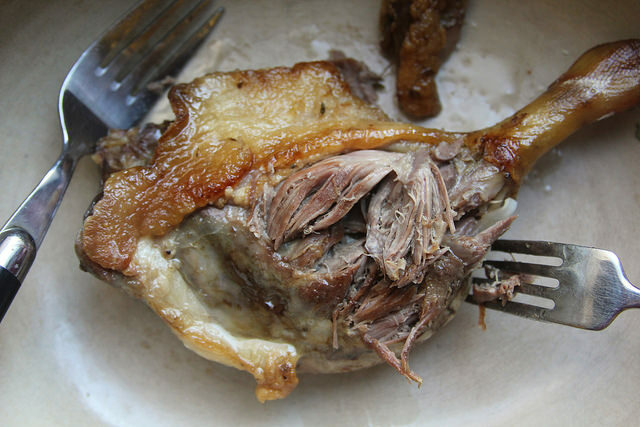 The thing a lot of people hate about duck is all the fat it has; the thing a lot of people also love about duck is all the fat it has. I have more duck fat stored up in mason jars in my fridge than just about anything else, but that just means I should remember to use it to roast potatoes or to cook just about anything with more often. This stuff is liquid/solid gold to many cooks, and buying tubs of duck fat alone is expensive! But it comes as byproduct whenever you’re cooking duck. The other thing is skin. 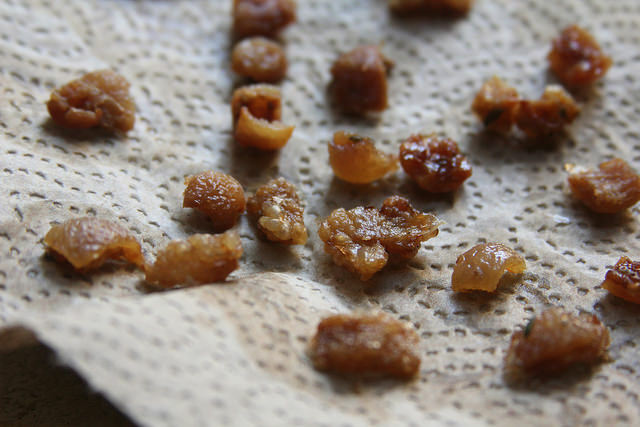 I stole some of the skin from my duck leg to make a few crispy duck skin cracklins for my pasta dish. Don’t listen to recipes that tell you to “trim” and “discard” “excess” fat — by all means save it, and, if you can, ideally use it in the same dish you’re making somehow. In the case of a duck leg-meaty pasta, a few crackly pieces of skin seemed like a good topping. It could work on top of a salad, too. Gooey skin pieces might not be as great braised along with the meat in the pasta’s sauce, but they sure make a good topping, so don’t discard. No matter what they say. 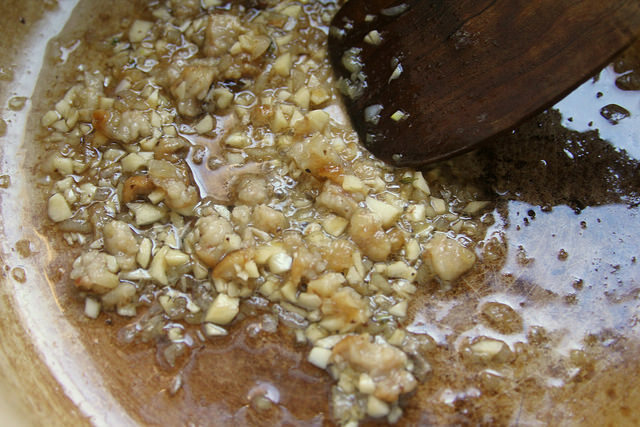 At the very least you could add a few pieces of it to the aromatics that you’re sauteeing, as if they were pieces of bacon or lardons. These will toughen and brown in the process, adding umami to the sauce (along with flavorful fat). Oh, there are millions of possibilities for every piece of duck or any animal for that matter, and my dog did not want for any last scrap in the process. 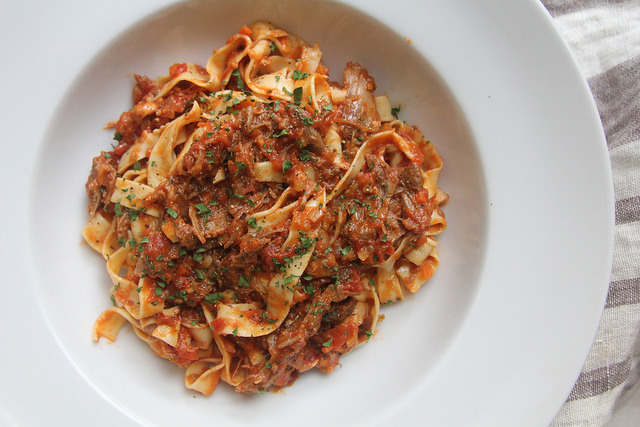 But let’s get back to this ragu, shall we? Dry white wine. Don’t skimp on it. The more, I came to find, the better. I’m sure there’s a cap to that statement but I seriously couldn’t stop adding more to get a slightly thinner texture and intricate flavor that the acidic tomatoes alone couldn’t offer. Usually when making tomato-based sauces, you want to get more body from tomatoes themselves — from a dab of tomato paste, for instance, or from cooking the tomatoes for a really long time. But with ragu, the proteins and fat from the meat used will add that emulsifying creaminess aplenty. So you can go light on the tomatoes, and big on white wine and stock for flavor. Thankfully, I had some homemade chicken stock from a leftover roast chicken to buffer my sauce along with wine and duck meat. 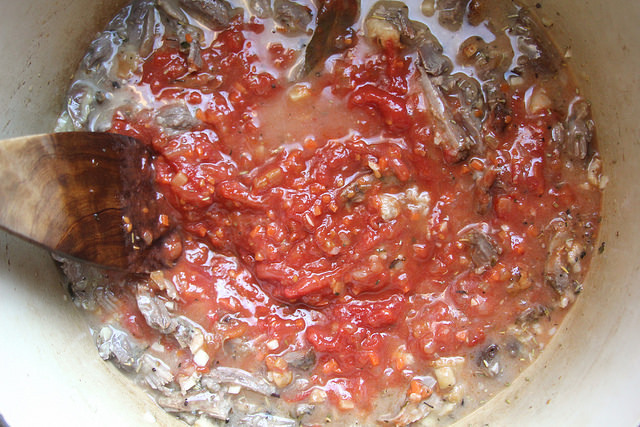 Combining the tomato and duck-wine sauces. Okay so maybe in total, this is a crazy feat to pull off — a duck ragu, replete with homemade pasta and duck skin cracklins and all. But what if your crazy weekend feat was making an excellent Sunday dinner? What if, then? Well, if that was the case, then I want to be your friend, basically. I’d like to eat with you. 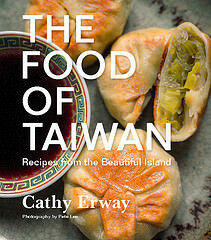 And if you can dig me and my crazy food-obsessed propensities, then I want to cook something for you, too. What is a better Valentine’s Day than that? Preheat oven to 275 degrees. “Steal” a piece of the duck skin to make the cracklins with. 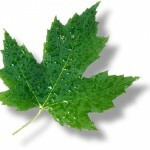 Cut the piece of skin into ½ – 1” squares, to yield about 12 or so squares. Arrange the squares on a baking sheet at least 1 inch apart from one another. Heat a heavy-bottomed pot or pan with the olive oil over high heat. Remove the garlic and thyme from the duck leg; chop the garlic and set aside. Once hot, sear the duck leg on both sides in the olive oil until gently browned, about 2 minutes to each side. Cover the pot and transfer it to the oven. Also, transfer the baking sheet with the duck skin squares to the oven. Remove the baking sheet with the duck skin squares once they appear uniformly crisp and gently browned, about 10 minutes. Continue cooking the duck leg at low heat, covered, for 1 to 1 ½ hours. Remove from heat and allow to cool. 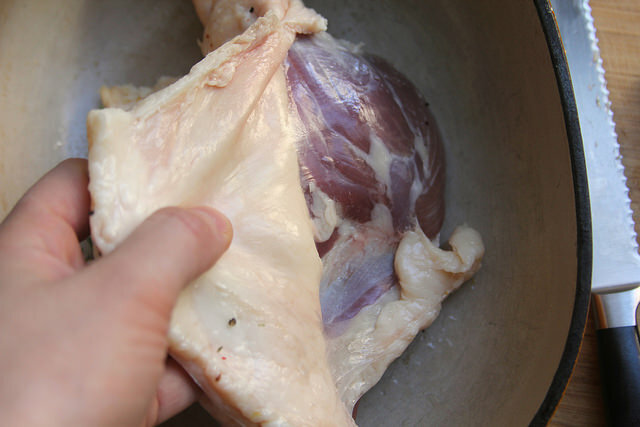 Once cool enough to handle, pull the meat from the bones and gently shred or chop to small pieces. 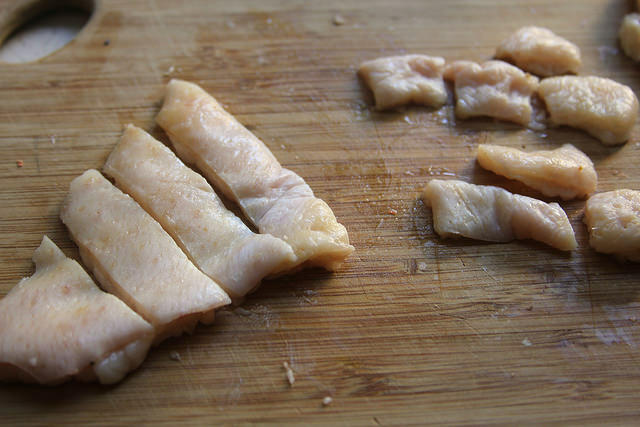 Chop the remaining skin and fat to small pieces. Drain all but about 2 tablespoons of the duck fat from the pan and reserve for another occasion. In the same pan, add the chopped pieces of skin and fat and allow to slightly brown over medium-high heat, stirring occasionally, about 2-3 minutes. Add the onions, carrot, celery and chopped garlic along with a pinch of salt and pepper and reduce heat to low. Cook, stirring occasionally, over low heat until the vegetables are well softened, about 10 minutes. Add the white wine and increase heat to bring to a boil. Scrape the bottom of the pan to deglaze the wine, and allow the wine to reduce to about half its volume, simmering uncovered about 5 minutes. Add the chicken stock and bring to a boil again. 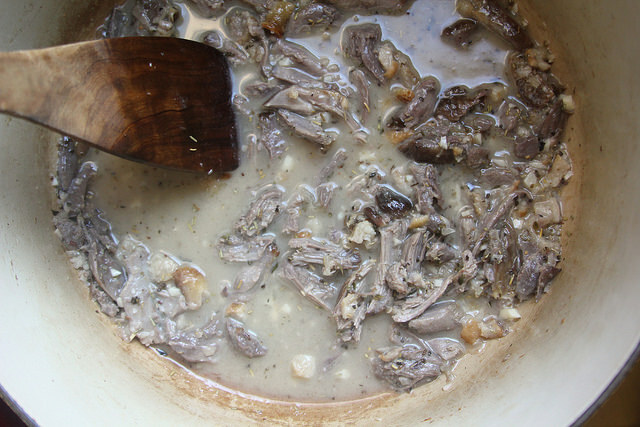 Add the shredded duck meat to the pan, along with the bay leaves and bring to a boil again. Add the tomatoes and all their juices, bring to a boil, then reduce to a low simmer. Drop in the bouquet garni of fresh herbs (made by tying a couple sprigs of the herbs around the rest of the bunch to form a bundle). Cover the pan and let simmer for 1-2 hours, checking occasionally to give a stir and ensure that the sauce is cooking on a very low simmer. Taste for seasoning, adding salt and pepper as desired. Remove the bouquet garni and bay leaves before serving. Boil the pasta to al dente. To serve, toss the cooked and drained pasta with the sauce, and top each portion with the optional toppings of chopped parsley, grated cheese and a drizzle of good olive oil in addition to a handful of the duck skin cracklins to finish. Eight brownie points: This is not a low-calorie, low-fat, low-carb meal. It’s none of those things to a hilt — even the pasta itself is a rich, egg yolk-drenched affair. You’ll get your week’s share of duck fat from the sauce, too — but then, who eats this once a week? Savor it for an occasion. At least you’ll know exactly what’s in your sauce when you make it from scratch. Great dish! Love the photos too. I would love see this dish with crispy duck though. But I love it and I’ll try it. I’m a newbie in food blogging. I’d be happy to check my blog as well. It looks so delicious~ I feel so hungry when reading your post! Gonna head to the kitchen 🙂 Thank you for sharing the recipe!